IN 2017, The Bookseller trade publication ran a survey to investigate issues around harassment within the U.K.’s publishing industry. While the results were alarming – more than half of the 388 respondents reported experiencing some type of harassment – there is some positive news. The results led to the development of an industry-wide code of conduct in the U.K. 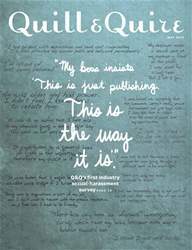 It also inspired Q&Q to take a look at the prevalence of sexual harassment within Canadian publishing.